Chives belong to the onion family. Unlike onions though, the stems (straws) of the chives are used for consumption instead of the bulb. Their taste is a lot milder then that of the onions, which makes them excellent for enhancing the flavor of many dishes. The plants are perennials and can grow 1 to almost 2 feet long. They produce purple flowers during the months of April - June and only require well drained soil to grow. Many gardeners like to plant chives because of its insect repellent qualities. With only 8 calories per 1/4 cup (25g), chives provide an excellent source of vitamin A, vitamin C and vitamin K.
Chives are the smallest member of the onion family and provide health benefits through their sulfur containing phytonutrients. According to researchers with the National Cancer Institute, chives and other allium-containing vegetables (e.g., onions, scallions, garlic) may reduce the risk of prostate cancer by 50 percent. Chives are also rich in calcium and iron and some evidence is found that chives can improve digestion and reduce high blood pressure. Mention of removing parasitic worms is made, but not proven yet. 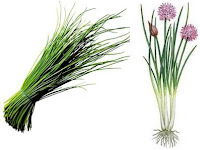 Oil derived from chives is said to have antibacterial properties. Consuming large amounts of chives can cause an upset stomach, but since it is usually eaten in very small amounts this hardly occurs. You can use chives fresh, dried or frozen; neither one diminishes any of its benefits or taste. Many recipes lend themselves very well for adding some chives; something to keep in mind, huh? Another benefit is: chopping chives is less of a tear jerker then chopping onions. That is good because enough tears will already be shed during this life. We can make them even less by rejoycing and being grateful for all the blessings God constantly gives us!